Learning how to drive safely in a variety of traffic situations requires a lot of instruction, practice, and exposure. The first years of driving are often the most dangerous. Crash rates are at the most high within the first months of driving. How to keep your young driver safe on the road? Discuss and sign a Parent-teen Driving Agreement with your young driver. To earn a license, your teen driver is required to complete 60 hours of supervised driving. This experience will prepare your young driver to understand potential risks and safely navigate the roads when driving alone. Enforce the GDL restrictions and guidelines for supervised driving with your new driver. Remember – the GDL requirements are a minimum. More experience and exposure with a responsible adult is better. Ride with your teen driver in a variety of situations and roadway types, including nighttime driving, driving in rain, rural roads, highways, etc. Additional stress can make fluster your young driver and make it difficult for him or her to react correctly. If your young driver experiences a near miss, ask them to pull over and discuss the situation. What could have been done to prevent this near miss? How will you avoid this situation in the future? Use “I” statements to explain how an experienced driver handles the road. “When I’m driving, I pay attention to two cars ahead of mine. If I see brake lights down the road, I slow down early, even before the car in front of me brakes. Ask your young driver higher order thinking questions, which will help them to anticipate risky situations and predict what other drivers may do. What is different about driving conditions during a sunrise or sunset? Discussion: Drivers who are traveling toward the sun may have a harder time seeing things the road. During this time of day, never assume that a car can see you. How can you tell if someone is driving distracted? Discussion: Swerving back and forth in lane. Traveling for distances while straddling two lanes. Running off of the road. If you suspect someone is driving distracted, what should you do? Discussion: Stay away from the swerving vehicle as much as possible, while still maintaining a safe speed. Why should you leave space between your vehicle and the vehicle in front of you? Discussion: The distance between you and the next vehicle is how much space you will have to stop in time. If you follow too closely, you risk hitting another vehicle. How do you spot an aggressive driver? Discussion: An aggressive driver may be speeding and tailgating other vehicles. Anticipate that he or she may try to cut in front of you in a relatively small space. Don’t try to “block” aggressive drivers, instead, give them more space and try to be patient. Anytime that your young driver goes out, ask about rides and who will be driving. Research shows that riding with other teen drivers is risky and additional passengers only add to the chances of a crash. Utilize free safe driving apps to monitor driving when you are not in the car. Before handing over the keys, discuss and enforce the 5 to Drive (see below). Discuss these rules (developed by NHTSA) with your young driver before handing over the keys. Lead by example by following these rules as well. Remind your teen that drinking before the age of 21 is illegal, and alcohol and driving should never mix no matter your age. Buckle Up. Every Trip. Every Seat. If you wear your seat belt every time you’re in the car, your teen is more likely to follow suit. Remind your teen that it’s important to buckle up on every trip, no matter how far or how fast. Distractions lead to crashes. One study done by the AAA Foundation for Traffic Safety found that half of teen drivers on cell phones did not brake or steer before crashing (AAA). Remind your young driver about the dangers of using the phone while driving—whether it’s texting, calling, navigating, or changing music. 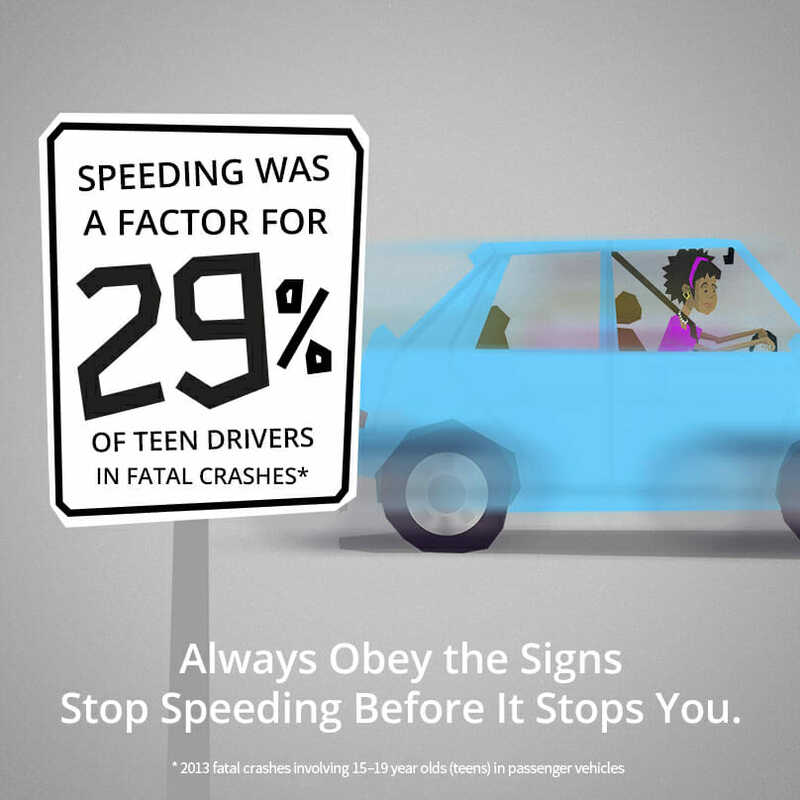 Drive the speed limit and require your young driver to do the same. Every time speed doubles, stopping distance quadruples. No More Than One Passenger at Any Time. 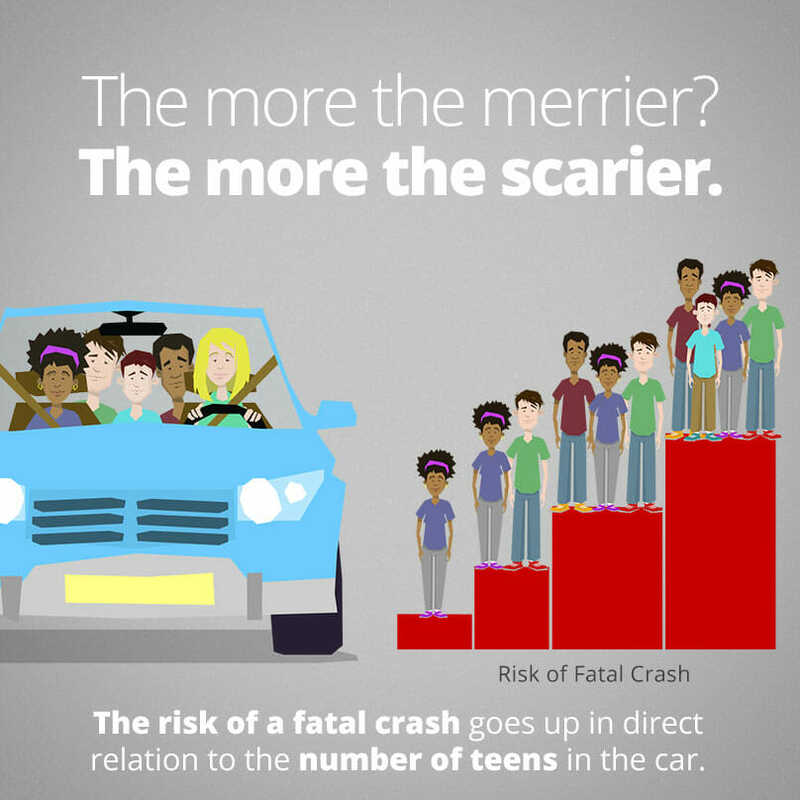 With each passenger in the vehicle, your teen’s risk of a fatal crash goes up. Don’t allow your new driver to ride with more than one passenger unless you are also present in the vehicle. Learning how to drive? Awesome. Unfortunately, the first few years of driving are often the most dangerous. It’s important to be aware of the risks you now face behind the wheel. But don’t be discouraged. You have the power and ability to keep yourself and your friends safe by following these guidelines. A conviction of drinking and driving underage in North Carolina costs approximately $2,000 (including fines, court costs, and attorney’s fees). Without a seatbelt, a person is 30 times more likely to be ejected from a vehicle. 3 out of 4 people who are ejected from a vehicle during a crash are killed (NHTSA). Distractions lead to crashes. One study found that half of teen drivers on cell phones did not brake or steer before crashing (AAA). Put your phone in the glove box to eliminate the temptation. When your speed doubles, your stopping distance quadruples –meaning that it takes three times longer to stop. With each passenger, your risk of being in a fatal crash goes up. Speak up. Passengers accounted for nearly 1/3 of all traffic fatalities in the U.S. in 2013 (IIHS). It is your right as a passenger to speak up if you feel unsafe. In any vehicle that you occupy, you have the power to prevent a crash. Empowered Passenger. Call attention to bad drivers. In a car traveling 30 mph, a person not buckled up can weigh as much as a midsize car when thrown in a crash. That impact can kill another passenger. Even with their eyes on the road, a person talking on the phone while driving can be cognitively “blind” to up to 50% of their physical surroundings. In North Carolina, new drivers between the ages of 15 and 18 must complete the NC Graduated Driver Licensing (GDL) program, which consists of driver’s education and two levels of permit restrictions preceding a full provisional license. Driver’s Education is provided in all 115 school districts in North Carolina and is available to all public, private, charter, federal and home school students enrolled in the state. Research has shown that “good” GDL programs (as classified by the Insurance Institute for Highway Safety) can reduce teen motor vehicle fatalities by 19.4% (Morrisey, Grabowski, Dee, & Campbell, 2006). Fatal crashes involving 16-year-old drivers in North Carolina declined 57% after the implementation of the GDL program in 1997 (Foss, Feaganes, and Rodgman, 2001). For a simple summary of the GDL program, click here.